How does the 'Pay What You Can' Clinic Work? How much do I need to pay for my services? How can Kwai Fah offer this clinic at such low rates? Who performs services at the clinic? When does the clinic take place? Can I make an appointment for the clinic? What service(s) will I receive at the clinic? Can I come to the clinic every week? The clinic follows a very basic model: show up, receive services! Upon arrival, if there are still slots available, you'll be checked in by a member of our staff and given paperwork to fill out (if applicable). The practitioner will determine your method of treatment, which may be in an individual or group setting. Patients will be treated in the order in which they arrive. If the clinic has reached capacity, you will be notified upon your arrival. Once you have received your treatment, you'll receive a handout with information about the service(s) you received, and you will then pay for your service. We stand by the name of the clinic - 'Pay What You Can'. While we suggest a minimum of $20, it is entirely up to you and your financial situation. We will not ask for you to prove your financial situation or provide documentation. We offer this clinic because many people genuinely cannot afford to pay normal service rates. When your service is complete, your practitioner will give you a sheet that outlines what your service would have cost (which typically ranges from $50-$90), and all we ask is that you pay what you honestly can for the service! We believe that everyone should have the opportunity to experience healing, regardless of how much money is in your bank account. This clinic is our way of giving back to the community and helping those in genuine need. Because the clinic is first come, first served, we eliminate any time lost for cancelled/late appointments, and are able to provide services immediately to those on site. This clinic is offered through our partner Dr. Jean-Rafael R. Heiz-Neri (or JR for short). You can read more about JR's background HERE. The clinic is held at Kwai Fah every Wednesday from 6pm - 9pm on a first come, first served basis. It is up to the practitioner's discretion to close the clinic early if there are no patients, so it's best to arrive as early as you can! We'll post on our social media pages if a clinic will be canceled, so be sure to follow our pages! Cash and checks are the preferred forms of payment. However, we also gladly accept Visa, Mastercard, Discover, and American Express. FSA and HSA cards are also acceptable forms of payment. Sorry, you cannot. Due to the high demands of this clinic, and to avoid cancellations and waits, we offer service slots only on a first come, first served basis (patients will be served in the order in which they arrive). The practitioner will determine which service(s) you will receive. This will be based on his evaluation of you, as well as the current demands of the clinic. You may receive acupuncture, cupping, gua sha, reiki, sintergetica, and/or manos. You are unable to request a particular service, however, if there is a service you do NOT want, please do let the practitioner know. Additionally, should there be a high demand at the clinic, the practitioner may choose to perform services in a group setting. Yes! The clinic is open to everyone, every week. 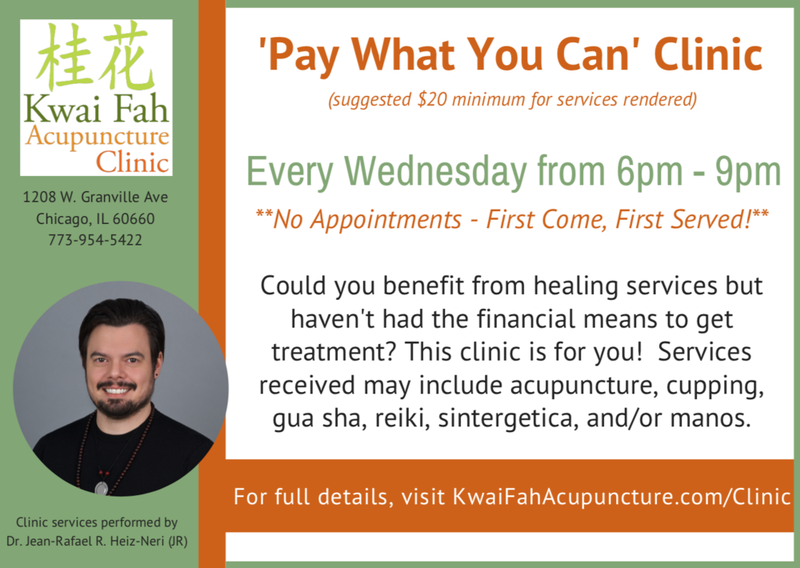 If this is your first time visiting Kwai Fah Acupuncture Clinic, you will need to fill out our new patient paperwork. You can either complete this on site during your visit, or for faster service, download the paperwork HERE and complete before you arrive! If you've been here before, then you will not need to fill out additional paperwork! who can i contact for additional questions about the clinic? If you have additional questions on the clinic, please speak with a member of our staff during your next visit, or otherwise submit your question below! Thank you for your message! A member of the clinic staff will be in touch with you as soon as possible!